The New World is a true work of art blended with the finest tobaccos found in the four main tobacco regions of Nicaragua. 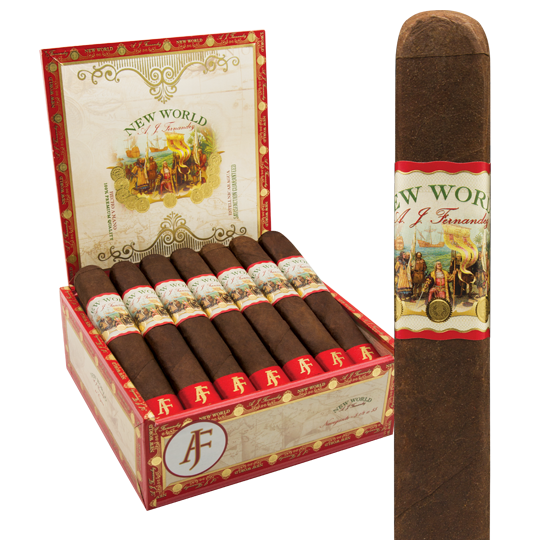 The New World is a true work of art blended with the finest tobaccos found in the four main tobacco regions of Nicaragua. Hand selected wrapper and fillers from Esteli, Ometepe, Condega and Jalapa are showcased in a beautiful medium to full-bodied box pressed cigar. Notes of coffee, pepper, wood, and chocolate enthrall and entertain the palate. Embark on the Journey. Navigate your way right into a box of these delicious Robustos. A spicy Sumatra wrapper covers top of the line Nicaraguan fillers creating the ultimate full-bodied cigar. Crafted by the legendary A.J. Fernandez, the New World is with out a doubt one of the hottest new brands on the market.